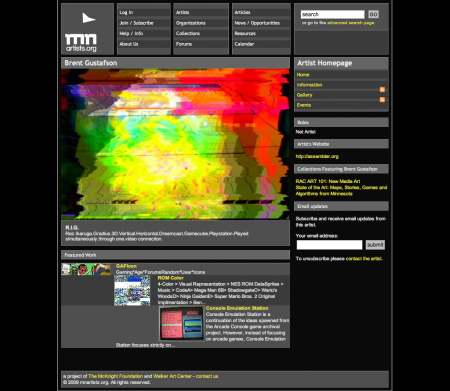 For the past month or two, we have been working on changes to mnartists.org. We deployed some of these changes several weeks ago, and just deployed even more now. I thought I would take some time to highlight the enhancements and new goodies. 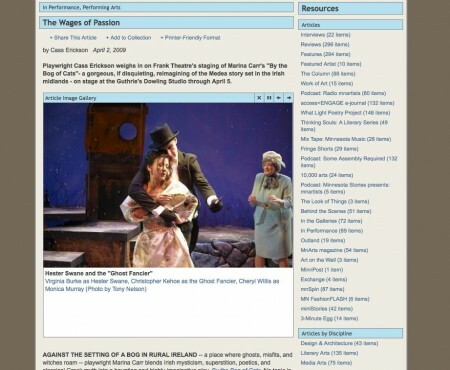 The first change you’ll notice when visiting the site is that the home page got an overhaul. The rotators for New Artwork and Featured Collections were changed to display images to the full-size of their boxes and they animate smoother. This means sometimes cropping work, but we think it’s a trade-off worth making. Articles are also displayed with a three-tier hierarchy, allowing the site to call recent writing out more prominently, even though we feature six instead of 10. 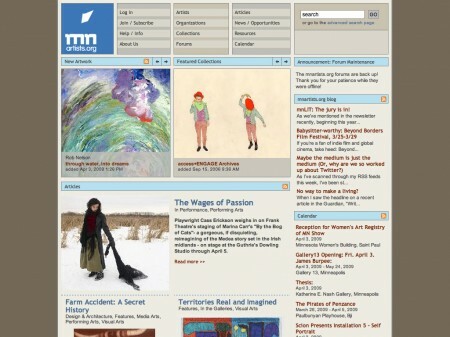 The sidebar on the homepage has also been reorganized, bringing the mnartists.org blog to the top and adding links to the Facebook and Twitter profiles for mnartists.org. Articles got some attention in several ways. First, we changed the way images are displayed by adding a larger expanding gallery at the top of each article, rather than having small images thumbnails listed down the left side. On the back end for editors, we also added an enhanced editor (tiny mce) to allow for richer control over formatting and even embedding other media. Across many areas of the site, you’ll now see a link to Share this article/artwork/collection/event. 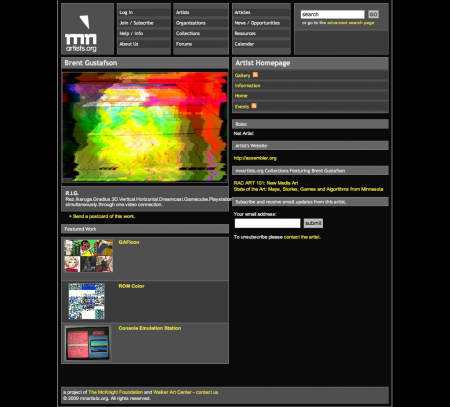 Using much of the same code we developed for the Walker Calendar, sharing is now easier on mnartists.org. We connect with Facebook, Twitter, Myspace, Delicious, Google Bookmarks, and Yahoo Bookmarks, as well as rolling in email links in a few places. The one change that will probably make everyone cry tears of joy is the search results refinement. We’ve heard lots of complaints about the search, not wholly unfounded. The search actually works pretty good, but the simple search weights everything more or less equally. 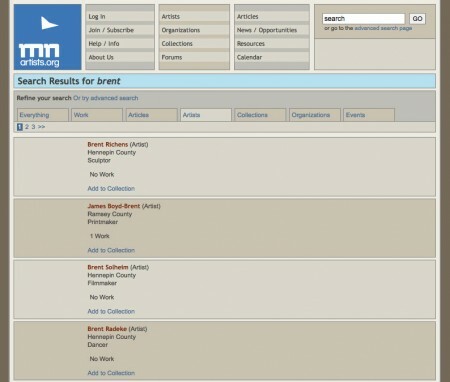 If you search for someone’s name, hoping to just get their artist page, it will be in the results, but there might be other things that rank higher. The revised search result page lets you change your simple search into an advanced search, using tabs above the results to select the type of resource you want to search for. This is very similar to what google does with their search results refinements (web, images, video, maps, etc.). New search results with refinements. Artist pages also got an overhaul with two big changes. First, images for each artwork will display at a new, larger size, about 519px tall and/or 520px wide. For artworks with more than one image associated, a gallery rotating gallery will cycle through the images. Previously, if an artwork had more than one image associated, only the first would show up, and the rest would be listed in the “Related Media” list. Secondly, we changed the way Related Media works. 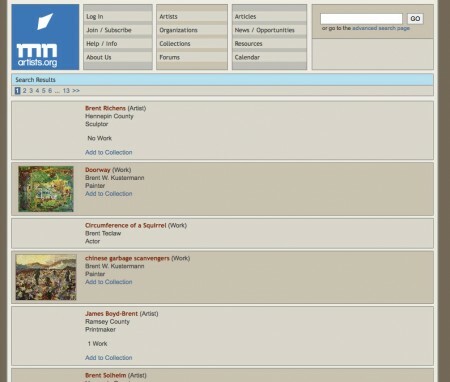 Now, it is simply “Media List” lists every type of media associated with an artwork. More importantly, for non-image media, such as video and audio, we embed the media in the actual page. So if you upload a quicktime file, the quicktime embed code will be generated and put right into the page. MP3 audio files will be played with the jwplayer flash player, making audio on the site a lot more nifty. We’re using the excellent jquery.media plugin to do this. This approach to handling media isn’t without some issues, but given the variety of media already on the site and our resources to work on it, this is the best solution. We are looking at making more substantial changes to this in the future, but this is a good incremental improvement. Artwork with video before changes. The image size and media enhancements have also been applied to the collections area of the site. 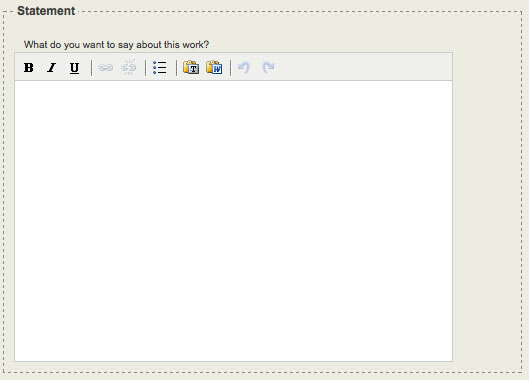 Another change we made a month ago was adding a visual editor to various form fields on the site. Prior to the change, users could only enter a very limited selection of markup to entries, [b] for bold, [i] for italic, and [a] for a link. We’ve eliminated that and replaced it with the new editor (tiny_mce), which allows for bold, italic, underline, unordered lists, and links. While seemingly simple, it was actually quite a challenge to deal with both the legacy code and the new formatting. 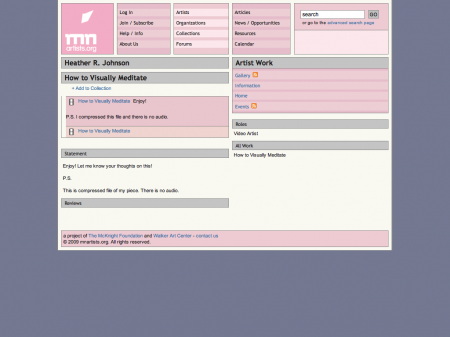 The text actually goes through several transformations between the editor, the database, and being displayed again. Keeping everything consistent is a non-trivial pile of regular expressions. One thing that we will have to keep an eye on is users pasting in text from Microsoft Word. Word tends to shove a bunch of garbage pseudo-html into the clipboard, and when pasting, it can be difficult to filter out. The editor has a button to Paste from word (with the blue W) that helps. If you notice any problems with the site, please let our community manager or myself know. Bugs may crop up, and we do fix things.